Build-a-bike event with the Johnson Business School at Cornell University. 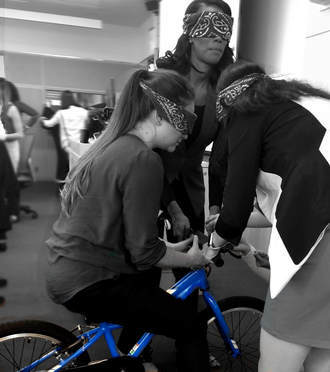 Connect with your friends or co-workers while learning about bikes! Bicycle maintenance is a great medium for practicing cooperation, direct communication, problem-solving and self-reflection. It can also be a way to learn about sustainability and healthy habits. Vie Cycle will design a program specific to your group and we can come to you! Get artsy making jewelry from recycled bike parts. Learn basic bike skills and go on a group ride or bike trip. Work together to learn and teach each other about basic bike repair. Interested in a teambuilding and leadership workshop? Get in touch to request more information or design a course!